This composition has a great deal of burst, but is also able to effectively kite almost any team to oblivion. 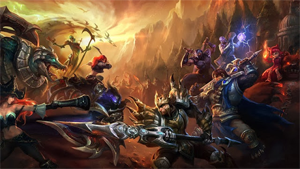 Between Nunu and Varus, enemy teams will have difficulty getting anywhere fast. Meanwhile, Aurelion Sol and Brand also provide huge slow potential once they pick up their items. This allows your team to toy with enemies at will. This composition has a great deal of burst, but is also able to effectively kite almost any team to oblivion. Between Nunu and Varus, enemy teams will have difficulty getting anywhere fast. Meanwhile, Aurelion Sol and Brand provide huge slow potential once they pick up their items. This allows your team to toy with enemies at will. Read on on how to play this comp! Varus [Marksman] - At max stacks, Varus is comparable to Kog'Maw in the amount of damage he dishes, resulting in a marksman who's able to absolutely melt both tanks and squishies alike. He also has a built-in heal reduction - this is key as kite/poke comps tend to lose out against sustain comps. Lastly, this team is a bit lacking in hard crowd control, and Varus provides just that. Aurelion Sol [Mid] - Aurelion Sol's waveclear allows this team to survive indefinitely in a turtle. However, most games don't get to that point as his map pressure gives his team the ability to snowball quickly through the early to mid-game. Meanwhile, Sol's ultimate provides a powerful disengage that can be used to prevent all-in compositions from gaining any traction. Brand [Support] - If there's one thing this team composition really lacks, it's burst damage. It has plenty of sustained damage and Sol can burst if he gets ahead. Otherwise, that's where Brand fits in with his ability to shred through HP like butter. Nunu [Jungler] - Nunu in this high damage composition gives you a pseudo-support for Varus, and by building Knight's Vow and Locket of the Iron Solari he makes up for your lack of peel. He also synergizes perfectly with both Varus and Sol, giving them much needed stats for maximum efficiency. Singed [Top Laner] - On this team composition, Singed doesn't necessarily fill a key role, but instead he just synergizes well with the rest of his teammates in the kite strategy. If you think this team is a bit too magic damage heavy, you can substitute him with an AD-based top laner. However, playing Singed top also allows you to build a melee range Abyssal Mask to maximize the rest of your team's damage. Although this team is best when kiting, don't be afraid to engage with Singed, Aurelion Sol, or Varus. It has plenty of peel if they counter-engage. Blood boiling Varus is generally the best in team fights, but early on Nunu + Aurelion Sol double roaming ganks are highly effective. Countering this team mostly involves getting some early game champions in that can also all-in to great effect. Katarina [Mid] - Killing Sol is best accomplished by getting in close and ending him before he can tag you with too many stars. In team fights, you also want to burst them as fast as possible. Katarina fits both criteria quite nicely. Maokai [Jungle] - If they intend on running around, make sure they're pinned to the ground instead. Olaf [Top] - Olaf's laning phase against Singed is one of the easiest, and if you can keep Singed out of the game it bodes well for your team. Braum [Support] - Against Brand, picking up Braum allows your team to mitigate his ultimate completly for a massive damage reduction. Miss Fortune [Marksman] - As the most burst-oriented marksman, putting Miss Fortune on the team gives you the ability to burst down Brand/Aurelion Sol before they can throw their damage on your team. Better yet, it may cause Brand to target her, allowing Braum to absorb his ultimate. Overall, this team also works very well, but does lack poke and Olaf needs to get ahead in order to be useful later in the game.